Areas such as outdoor kitchens, pool deck, patios, etc. When our AK Lawn Care experts are designing the plans, and providing suggestions, we like to bring focus on energy-efficiency LED lighting. These lamps are 80% more energy-efficient than standard bulbs, and can save you a significant amount of money long-term! AK Lawncare uses the best materials and workmanship in our projects, and completes the work methodically and within the stipulated period. We recognize that individual landscapes need the right type of exterior lighting to add to its beauty, usability, and security. 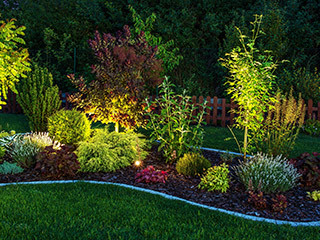 We work diligently to provide custom landscape lighting solutions that fit perfectly within your needs. For any more information about these services or for a detailed quote, call AK Lawn Care at 734-439-3063. You can also send us details about your project via this online form.